Headquartered in Cleveland, Ohio, the Chessie System was the creation of Cyrus S. Eaton and his protégé Hays T. Watkins, Jr., then president and chief executive officer of C&O. A chief source of revenue for the Chessie System was coal mined in West Virginia. Another was the transport of auto parts and finished motor vehicles. B&O 4444 (third to last GP40-2 owned by Chessie, last unit was B&O 4447) was the locomotive that pulled Ronald Reagan's 1984 presidential train through Ohio. The former Reading 2101 leading the "Chessie Steam Special" into Plymouth, Michigan in 1977. The Chessie System operated and exhibited a former Reading Company T-1 class 4-8-4 2101 on a national tour as the "Chessie Steam Special," beginning in 1977 in celebration of the B&O's 150th anniversary. The 4-8-4 had previously been used as one of three locomotives pulling the American Freedom Train. The train was painted in the Chessie System motif and consisted of the locomotive, two tenders, and eighteen to twenty passenger and baggage cars. The locomotive was severely damaged in a fire in March 1979 while stored in a Chessie System roundhouse. It has since been cosmetically restored to its American Freedom Train paint scheme, and is on static display at the B&O Railroad Museum in Baltimore, although has been exposed to the elements for a majority of its time there. In 2015, CSX recognized its heritage and gave a handful of locomotives predecessor logo decals. 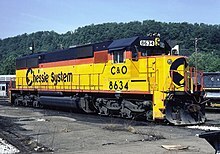 CSX AC4400CW 366 and C40-8W 7765 both received Chessie System Decals. 366's decal is the "Chess-C" and 7765 has the Now B&O" logo. Ori, Dave (2006). Chessie System (MBI Railroad Color History). Voyageur Press. ISBN 978-0-7603-2339-7. Wikimedia Commons has media related to Chessie System.